From the Southern delta to the central highlands. The above is the chorus of a song penned by Vietnam War veteran Britt Knox while he was a helicopter pilot back in the 1960s. He recently returned to 'Nam for the first time, after leaving Asia 48 years ago. "During our recent tour, I thought I'd return to see the places where we had seen heaviest action, but seeing Vietnam from the ground on a tour bus is entirely different from seeing the country during wartime flight conditions," acknowledged Woodbury resident Knox. "But, it was refreshing to share our experiences with other 'Nam vets and their spouses on the tour." 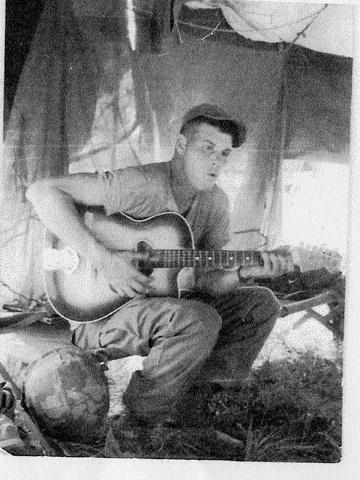 During the tour, a veteran from his old flight unit recalled that Knox had penned and performed songs while serving in the war during the 1960s' decade. "This song, entitled 'Army Tour Land' was penned by me, using the tune Woody Guthrie wrote by the title: 'This Land is Our Land,'" Knox noted. "Back in 'Nam, a two-star general would ask for poets and songsters (soldiers who performed music) to come to the base command and perform. 'Army Tour Land' was one of the songs that I wrote and performed." "For decades, I had no desire to return to Vietnam," Knox recalled. "However, while recently back in 'Nam touring with 10 other veterans, eight wives, and two former U.S. diplomats, the feeling among all of us, was that this land is part of us and that we do, indeed, care about it. We had skin in that game (war)." After that shared realization, Knox said he revised the chorus of his old song he originally wrote during the war. "We sang the revised chorus on the tour bus," Knox shared. His wife, Woodbury Councilwoman Faye Northcutt-Knox was on the tour. "Britt responded wonderfully to the trip, as he and other vets shared experiences … not a day (21 days total) went by, that Britt didn't share 'I'm so glad we came.'" Mrs. Knox shared. "Britt didn't recognize the terrain, which is understandable, because in the war, he had seen it from the air with shells bursting all around him," Mrs. Knox added. "Our tour, 48 years later, was a different perspective from wartime experiences." After months of flight training and longing to see action, Army Capt. Britt Knox had originally arrived in Vietnam, near Saigon, on Nov. 20, 1965. Knox was anxious to do what he was trained to do, but multiple days of rain initially kept his helicopter and crew at their 'Nam base camp: "After endless days and days of rain, I was going crazy." Finally, on Dec. 7, 1966, Captain Knox and flight crew were deployed to the mountains of Vietnam, where an American unit was pinned down by enemy forces. "In Vietnam's mountains, the turbulence was so bad, our crew was challenged merely to keep our aircraft under control," Knox recalled. The initial mission was a success … the first of 1,500 to 1,600 (estimated) danger-laden missions Knox would ultimately lead his flying crew. He eventually accumulated 1,520 hours of flight time, darting in and out of combat zones, sometimes in jungle terrain, sometimes on dangerous mountain tops. How good was Knox at flying his helicopter and taking care of his crew during perilous combat conditions? When ending his tours in 'Nam, Knox had been awarded the military's Air Medal with Valor, two Distinguished Flying Crosses, a Purple Heart (for wounds), two Bronze Stars, 35 Air Medals, the Army's Commendation Medal and the Army Individual Achievement Medal. "We were just doing our jobs, what we'd been trained to do," Knox shared modestly. "Some days, we would fly five missions in a 2-hour period," Knox accounted. "So, it wasn't hard to quickly accumulate flight hours and mission numbers. He contrasted Vietnam and World War II eras for military pilots. "During WW II, pilots would fly all day out of England to drop bombs over Germany, and that was just one mission," Knox noted "In 'Nam, it was a different war with different machines. We can only imagine the bravery of those WW II pilots and crews." On one of his early missions, Knox and his unit was the lead copter to extract units of American and allied troops in the midst of enemy fire. "Despite the enemy being close by, and us taking on fire, we were fortunate to extract two or three loads of our surrounded troops," Knox described. "If we didn't, they were in danger of being overrun by the enemy." On Jan. 15, 1967, Captain Knox and crew landed, despite their landing zone being under fire, to extract surrounded American troops. The 101st Airborne eventually awarded him the first of two Distinguished Flying Crosses. "When I became aircraft commander, it was a very big deal for me … bigger than any medal," Knox recalled. "When we landed safely back at base, that was bigger than any medal." In May, 1967, he was promoted to platoon leader, "responsible for 12 helicopters and 50 soldiers." In October 1967, Knox's war machine was shot out of the air by enemy fire. "I got wounded this time," Knox described. "That resulted in a Purple Heart." By this time, they were flying round-the-clock missions, with Captain Knox often reciting the Bible's 91st Psalm during missions. "After our chopper was shot out of the air, I was in shock after being wounded, and asked myself: 'Am I dead?'" Knox accounted. "I often quoted the 91st Biblical Psalm, when God was speaking to Moses: 'Since you have placed your love upon Me, therefore I shall honor you and deliver you.'" The former soldier described another dangerous mission. "Once, we had to practically land on the side of a cliff, as we were attempting an emergency evacuation of troops surrounded by the enemy. However, we were facing an attempted landing on the actual side of a cliff. But, we had to go in, or our soldiers would perish. "However, since there was no landing area of any type, we couldn't go straight in," Knox called. "Aircraft Commander Bobby Golden kept yelling, 'We can't do it! We can't do it!!' But, we had to go in! And due to the cliff, our crew chief climbed out on the skid, and he backed us in … to the point we hit a tree with one of our big blades. "You immediately worry about (the chopper's) sheet metal fabric coming apart, so there we were, hanging on the side of this cliff … when we started falling … I let her (aircraft) float down in order to finally set her on the ground." Miraculously, the flight crew survived. On Jan. 28, 1967, Knox had another close encounter with death. "It was during a rescue mission, a burning gunship exploded nearby, hitting my aircraft, and sending my aircraft's main rotor approximately 100 feet in the air, and crushing our fuselage like a beer can. I'm not sure how we survived." He again referred to the 91st Psalm: "You (God) are my refuge and my fortress … So surely you shall deliver us from the snare of the fowler, cover us with Your feathers and give us refuge under Your Wings." Knox recalls "a personal bad judgment flight" that endangered him and his flight crew. But, no one was injured in the long-ago flight misjudgment. "Fifty years later, I'm thankful about not having the guilt of causing deaths of my comrades, due to my mistake," Knox testified. The Vietnam veteran recalls getting sick after one perilous rescue mission when they brought American soldiers' bodies back to base in body bags. "After taking some time off from missions, I had resumed flying on April 28, 1968 in support of a battalion of 199th Light Infantry when two companies got surrounded by a North Vietnam Regular Army Regiment. We were delivering water and ammo into the night until the surrounded companies were rescued. Our aircraft was badly damaged. It was a miracle we survived. I was so emotionally wrung out, that's when I threw up after getting safely back to base … it was super terrible." This resulted in another Distinguished Flying Cross, this one by the 199th Light Infantry. Finally, it was time for Knox to come home. But war had changed him in multiple ways. "I left Vietnam very angry, and I ultimately decided against staying in the military," Knox shared.Upon finally returning safely on beloved Volunteer State soil, and entering his parents' (nationally-acclaimed newspaper editorial cartoonist Jack Knox and wife Speedy) home in Nashville, he observed what he believes helped deliver him safely out of the Vietnam war zone. "Mother had a model helicopter war ship, like the ones we flew in 'Nam, and on it, she'd attached three angels and she prayed the 91st Psalm on my behalf each day."